← Libertopia’s First Video: The Top 10 of Leftism! The statement hardly came as a surprise, as the organization has been maneuvering itself into a position of political dominance throughout the Western World via it’s popular stances against such things as BREXIT, Catalonia Secession and anything that has even a whiff of traditionalism. However, Mob-Rule Socialists are also quick to point out their very enthusiastic support for free stuff from the State, wealth redistribution and the silencing of dissenters through internet and art censorship. “Through the use of forcible wealth redistribution, a massive secret police state and a humanitarian system to re-educate and silence opposition, our society will finally know how peace and equality works,” Marx said. The group, known for their stirring 10 Reasons Why the Soviet Gulags were Good for Society and Why Capitalism is Ruining Venezuela, also released the above #TrySocialism infographic at Monday’s event. 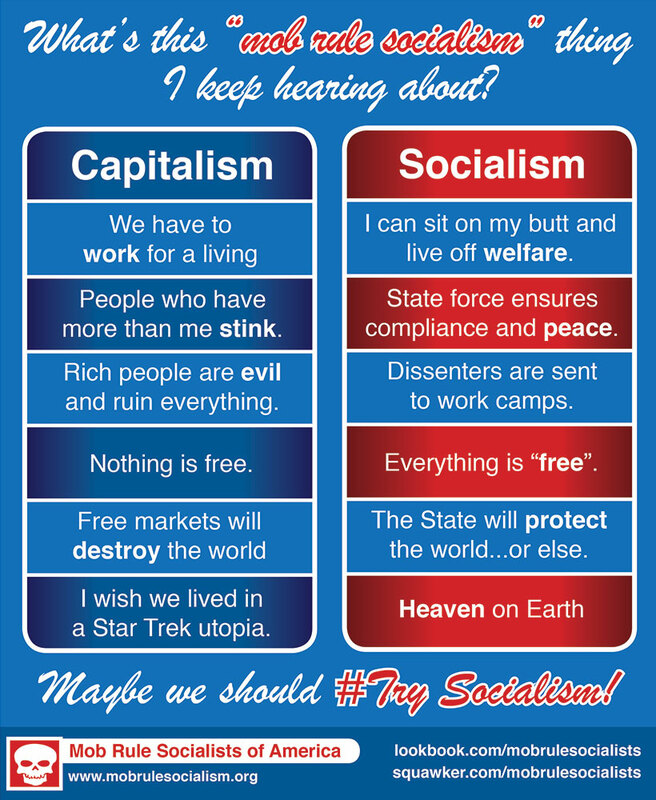 The graphic clearly illustrates the problems of Capitalism and why Socialism is the way for all civilized people going forward. According to the Global Bureau of Internet Surveillance, the graphic was reportedly downloaded 24 million times in less than four hours throughout the United States and Europe primarily by people in the 12 – 35 age range, with the #TrySocialism hashtag crashing social media platforms like Twitter and Facebook. 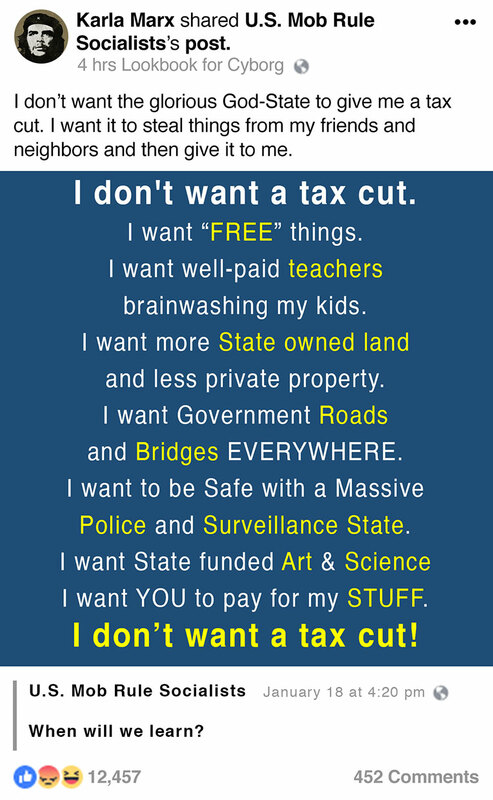 Marx, who has long argued against libertarianism and their nonsensical “Taxation is Theft” campaign, created an additional firestorm on Facebook the following day when her “I don’t want a tax cut” posting (as seen at left) prompted 12,4457 responses and 452 comments within the first 10 minutes of posting. Note: The above post is intended as a work of parody, humor or satire. Any relation to actual people, companies, organizations or present-day circumstances is likely just an unusual coincidence. Check out the rest of our libertarian cartoons right here! Want more from Galactic Imperium News? New Sci-Fi Series Promises to Surpass Star Trek Discovery! This entry was posted in Uncategorized and tagged #TrySocialism, anarcho-capitalism, art censorship, BREXIT, capitalism, Catalonia, civilized people, Free Market, free stuff, graphic, Gulags, humor, I don't want a tax cut, Infographic, leftism, libertarian cartoons, Liberty, mob rule, parody, Rich people, satire, secession, snowflake, socialism, Socialists, star trek, taxation is theft, United States, venezuela, wealth redistribution. Bookmark the permalink.